Creative skinning. And this is just one of the shenanigans. Pretty Girl Climbing Pretty Pass. It should sound sweet to refer to this pretty girl. We have joked about this being the year of the two week ski season. 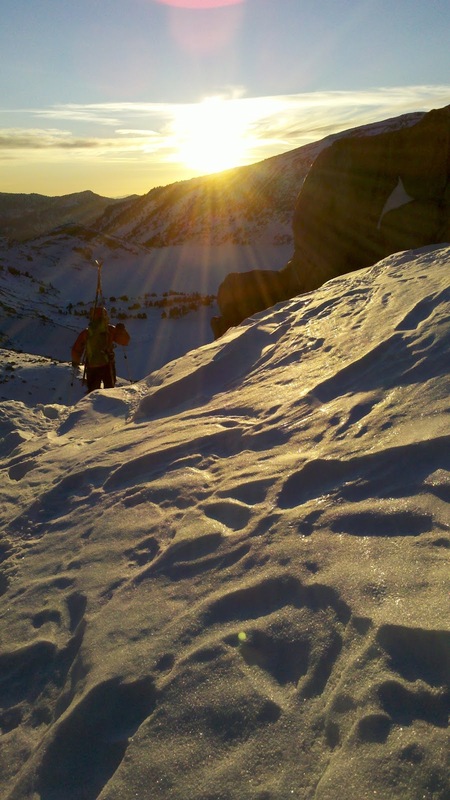 High Sierra skiers, in the past two weeks, have experienced a stormy weekend at the ski area, a day or two of backcountry powder skiing, a few days of corn-in-the sun and facets-in-the-shade, and a week where it has blown and melted off. That sounds like a full ski season, just raced through, start to finish in two weeks. Through it all the Mammoth Crest area has held reliable and good skiing. Efforts to extrapolate elsewhere have come up short. We watched from town as a series of wind events scoured the high country. Counting on dry ridge-lines, a buddy and myself made an alpine-climbing jaunt into the Palisades without skis. That endeavor yielded great ridge conditions and unexpectedly excellent coverage. I hesitate to say we should have been skiing, but, well, maybe we should have been skiing. Reacting to that adventure, and jonesing for some mileage, Alex and I returned closer to the "Mammoth Snow Belt" and slogged (with skis) from Convict Lake to the Mammoth Lakes Basin. On this tour we found less-than-ideal coverage and firmer-than-desired windboard surface. We made it work, covering a ton of miles in a beautiful section of the Range. More like a spring ski mountaineering outing this was not what one would call "fun". This was fun of one of the higher numbered types. Pretty Pass, Pretty Turns. But something about saying "Pretty Girl" makes me feel dirty. Ram Lakes. Scoured and shiny. Warren Miller doesn't use those terms in his dry commentary. Last light coming down Pika Pass. We lost snow and daylight around the same time. Yikes.